Lab facilities include artificial seawater systems at three different temperatures (two tropical and one temperate), each with isolated tank zones for in situ behavioral studies. We have daylight, red-light and dark zones for studying animal behavior, and automated behavioural analysis software that tracks multiple animals. E. scolopes is one of our core lab animals, meaning that we maintain a colony of squid in the lab, and they are used in many of our research projects. We raise our animals from eggs, and work with hatchlings, juveniles and adults. This very small species is commercially available and easily housed in small enclosures in the lab. We use adults of this species to study camouflage, neural physiology and cognitive behaviors. S. bandensis is a small tropical cuttlefish that is often readily available as eggs from commercial vendors. Cuttlefishes are slightly easier to rear from eggs than squid, and their neuroanatomy and behavior differ in interesting ways. We use cuttlefishes as comparative models in studies that also involve squid or octopuses, and sometimes in studies where particular, cuttlefish-specific cognitive behaviors are our main focus. A. aculeatus is an intermittent lab member. This species is known for autotomizing arms when threatened. We use this species to study how neural responses to stimulation and defensive behaviors change after voluntary arm cast-off. Very occasionally we receive animals that are not typical in our lab, either because they were caught accidentally, they were mis-identified, or they were gifted to the lab from other researchers. While we occasionally do research studies on these specimens, more typically we donate them to public aquaria or to experienced hobbyists that we know well. We never sell or donate animals to the general public. Our lab maintains an extensive food chain that supports nutrition and culture of our research cephalopods. While we don't formally conduct research on these species, we focus on continual refinement of rearing and housing conditions to optimize their survival, growth and welfare. We house several hundred grass shrimp in a naturalistic rocky-shore tank. Grass shrimp are the primary food source for our adult Euprymna and Octopus. These shrimp are native to Florida. These females are carrying eggs, but we don't currently rear shrimp in the lab. We may conduct some studies on the sensory physiology of shrimp in future. Mysids are small, (<1cm length) estuarine crustaceans that are collected from Florida for our lab. 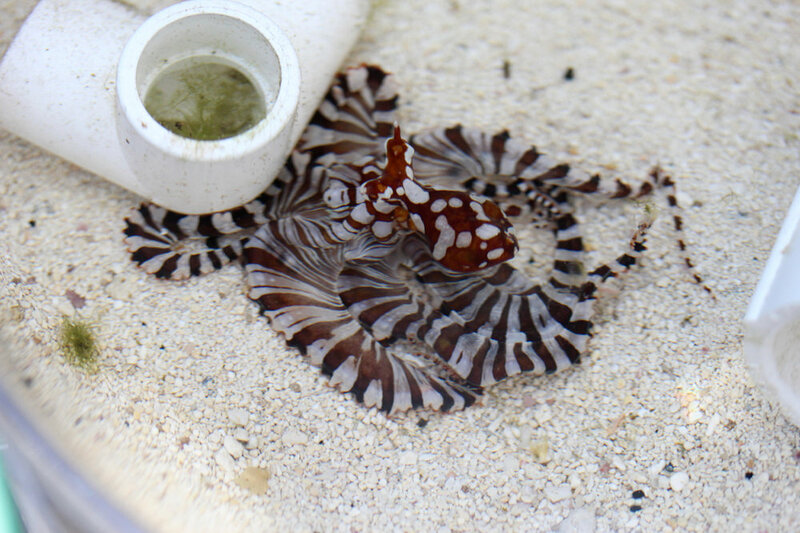 Our mysids are the main food source for our hatchling cephalopods. Mysids breed readily in our tanks and we are working currently to create a sustaining culture of them in the lab. We culture multiple copepod species in the lab to feed our mysid shrimp, and to provide early stage nutrition to our hatchling cephalopods. The different copepod species have varying adult and juvenile sizes, providing our cephalopod hatchlings with size-appropriate food for their first two weeks. These Tigriopus copepods (pictured) are feeding on phytoplankton, which we culture in the lab. Rotifers are the first animal in our food chain. We feed them phytoplankton that we culture in the lab, and they act as a carrier of the phytoplankton's nutritional content up the food chain. We feed rotifers to our mysids, our grass shrimp and directly to our 1- and 2-day old squid hatchlings.